"Mrs Creagh said that train companies need to offer female drivers more flexible working hours so they can care for their children"
Here's an idea, stay at home if the children are to be cared for. It's called 'housewife' and it is a duty not an option. Otherwise don't even pretend to call yourself a mother. Paul wrote: I grew up reading Bre'r Rabbit and other Enid Blyton stuff. Famous Five too. I do not believe there were any Muslim tank engines in Reverend Awdry's original stories, either. That'll need correcting. Or would it be offensive to put a niqab on a train, or to make a train in the image of Mohammed? At least there were no dogs in the stories.. or were there? Oh no, this is becoming so complicated! Like a microcosm of our over-all problem! I do recall that Enid Blyton has indeed been under 'discussion' (ie: vilified) in the past year or so. I read an article or two from this very chair on the matter. All the buzzwords were there: privelege, class, money, race, gender, cruelty (to animals - and foreigners), elitism, blah, blah.... I think a deal was made of the fact that she had a less than perfect marriage, and so she was sneered at for this also, in a typically heartless fashion. She wasn't really happy - ha, ha - serve her right! Maybe she did have flaws, like many other successful people but you would never have discovered that from her work. I had over a dozen, maybe a score of her books, all in a nice hardback form a little smaller than A5 size. Most of them were in differing shades of olive green and were the mainstays of my bedroom bookshelf. How fondly I remember them and wish I had kept them - though they were passed down to brother and sister, after which they were no doubt in less than ideal condition. I think I could say we all had our money's worth out of them - not that we paid for them - Mum did. Two shillings each I dare say. But - Bre'r Rabbit was definitely male. A born thief too, so he was, which is no surprise. The Fox and the Wolf were male too and neither of them were vegans. The Bear was slightly better but was still male (Mrs Bear was always absent because she was slaving away making porridge). Even Bre'r Turkey Buzzard was male. So was the angry farmer. It's quite obvious how sexist and cruel it all was. 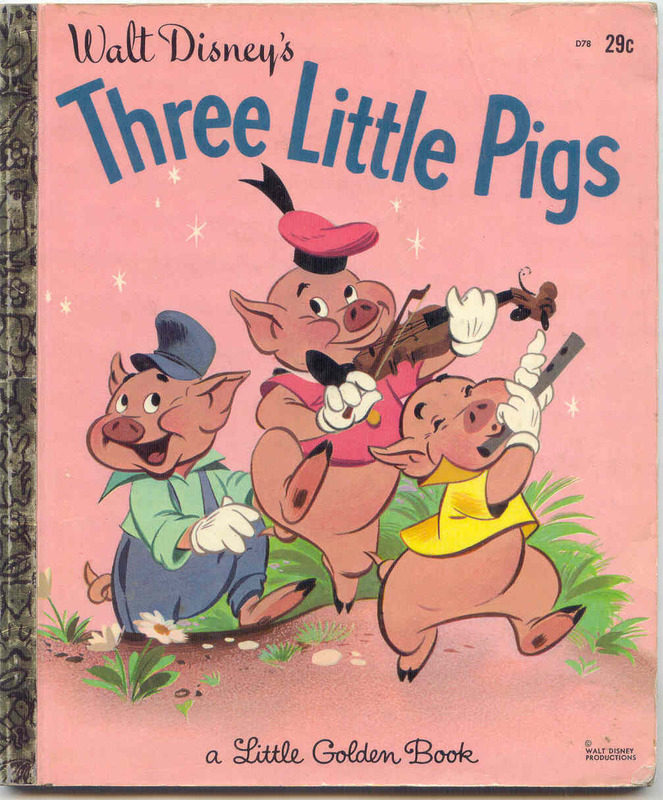 I'm off to read the 'Three Little Pigs'. I wonder if that's illegal now? PS: The porridge made by Mrs Bear was stolen (yes stolen) by ..... a GIRL. Paul, I used to like Bre'r Rabbit too! We used to have such lovely stories then. My dad (he was present) used to read "Down the Bright Stream" and "The Hobbit" to us at bedtime too. Such a nice thing to do. Today of course many parents can hardly even read themselves, despite having money for PlayStations etc. Islam teaches an aversion to pigs and dogs. Muslims ought to see this as a significant compatibility problem for themselves in a country where "bacon sarnies" are loved and the dog is a man's best friend - but given their growing demographic power they probably don't. Three Little Pigs has indeed been noted for its possible offensiveness and apparently there have even been proposals to rename "Baa Baa Black Sheep" to "Baa Baa Rainbow Sheep". Yes, Baa Baa Black Sheep is such an obvious target and I had heard much the same. Rainbow Sheep - lol - there are no such things. Imagine the animal rights brigade if there was. But the black sheep in the rhyme weren't actually negative creatures. They gave three bags of wool away. Obviously then, they were cruelly exploited. We read The Hobbit at junior school, as a class, and then I read it again in my teens (and again since). I haven't yet seen the recent film productions and, since learning it will be in three parts would rather wait until all three are produced and available before watching them all. But I have heard that the Orcs in the films are decidedly less.....black! In fact a lot of them are white. There could be some scientific reasoning in this because most of 'The Hobbit' orcs live underground (like the Morlocks in the Time Machine) beneath the mountains and so may have whitened skin due to lack of sunlight. But the real reason is that we don't want to be racist do we? You just know that's been mentioned and will be an issue. You know what is interesting. I am thinking of the most well known stam engines in German literature now . both female. There is a book for little children called "Jim Knopf" ("Jim Button and Luke the Engine driver") which features a white man, a black boy and two female steam engines called Emma and Molly. ... and some people call it sexist because the steam engine - which is a thing* - not a real thinking person - is female and also because Emma has a good intuition, feels Jims feeling which was thought to be a cliche about women. Michael Ende [the author] grew up in Nazi Germany. His father, Edgar Ende, a painter, was banned as "degenerate" in 1936. Ende began writing the story in 1956 to provide a contrast to the Nazis' racist ideology and their misuse of the theory of evolution. In a 1991 radio interview, he stated, "The idea of racism and racial discrimination came from further consideration of Darwin's theories." Quoting Nazi euphemisms, he added, "The 'extermination of lives unworthy of life' and 'concentration camps'." Ende did not see his book as a children's book, but just wrote it for himself. He based the title character on Jemmy Button, a native Fuegian who, as a teenager in the 19th century, was sold for a mother-of-pearl button and taken to England. He later returned to his homeland on the HMS Beagle, by way of the Galapagos Islands, along with fellow passenger Charles Darwin, who later wrote about the episode. That Ende's book was full of Nazi symbols and imagery turned on their head, and that its English references stemmed from his interest in Darwin was unknown until late 2008, when Julia Voss, a German journalist, published an article in the Frankfurter Allgemeine Zeitung revealing the story's background. Voss cites aspects of Ende's book and of English colonialism, showing their similarity. Her examples of Nazi education and indoctrination, as well as information about Ende's own experiences with it, reveal the sources that inspired him. So basically you can write what you want you will be called racist and sexist anyway. * albeit as I hear a thing with human emotions very much like Thomas the tank engine. I only watched the movies and it was when I was a young child and do not really remember.